It is fresh, crisp and nutritious. 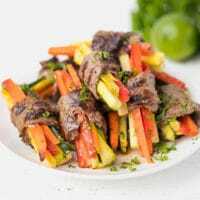 Paired with homemade balsamic vinaigrette, which brings all ingredients together and makes the salad perfectly delicious! I made it for a quick lunch the other day and just couldn’t stop taking pictures of it. Then of course I had a hard time choosing pictures to post, since it looked colorful and beautiful. It is really easy to throw together, too. Almost no chopping involved and it can be stored in the fridge in air tight container without the dressing on for 2-3 days. Pomegranates are in season, I just bought a dozen, because I love them and it is the perfect time to just build a salad around them. 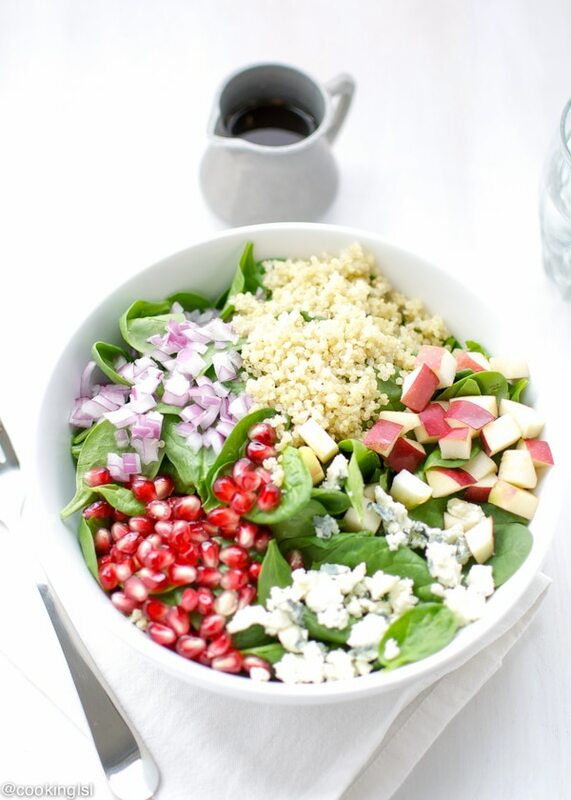 For this salad I used baby spinach, pomegranate, quinoa, apple, onions and blue cheese. Then I felt adding some extra crunch will be nice, so I added a handful of candied pecans I had in my pantry. It worked fine, adding the nuts created a depth of flavor. A simple, but very balanced combination -blue cheese brought creaminess, light sweetness from the pomegranate, crisp apple and some mild red onion flavor. 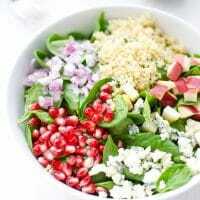 This salad is totally customizable, just feel free to add what you like. Well, you know I love quinoa, so I had to add some. It basically added some protein and made the salad more filling. 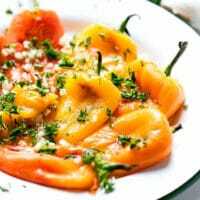 The salad is loaded with nutritious ingredients, perfect for the colder time of the year, when we tend to forget the importance of eating more fruits and veggies, to help keep our immune system in a good shape. 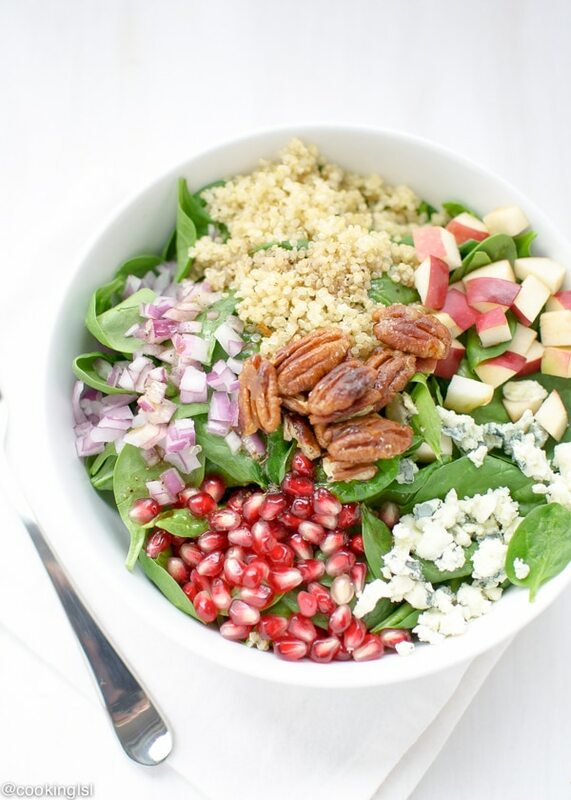 This Quinoa, Pomegranate and Spinach salad could be a great choice for your holiday menu, too! Enjoy! I think you might just have made my perfect salad. I just love pomegranate in salad. It gives it extra texture and a night little zing too. I love it. 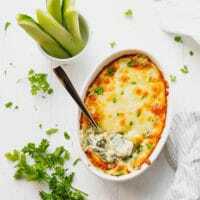 Great recipe 🙂 I am going to share on Twitter. I wish I were having this for lunch today!! So gorgeous. What a beautiful salad, Mira! I love all of the colors and flavors in this dish. I’ve never cooked with pomegranate seeds before, but I love their flavor! Such a great salad! Pinned! YUM YUM YUM! this salad is screaming my name right now! 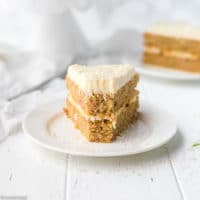 absolutely de-lish pinned! 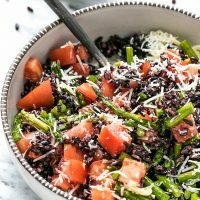 I love everything about this gorgeous salad! The apples and pomegranate make this so pretty and festive and perfect for fall! Love the pictures too! This is a gorgeous looking salad Mira! Love how bright and colorful it is. Pinned! n gorgeous pictures like always! Thanks Cailee! I knew you were gonna like it! Wow! I am digging your photography! 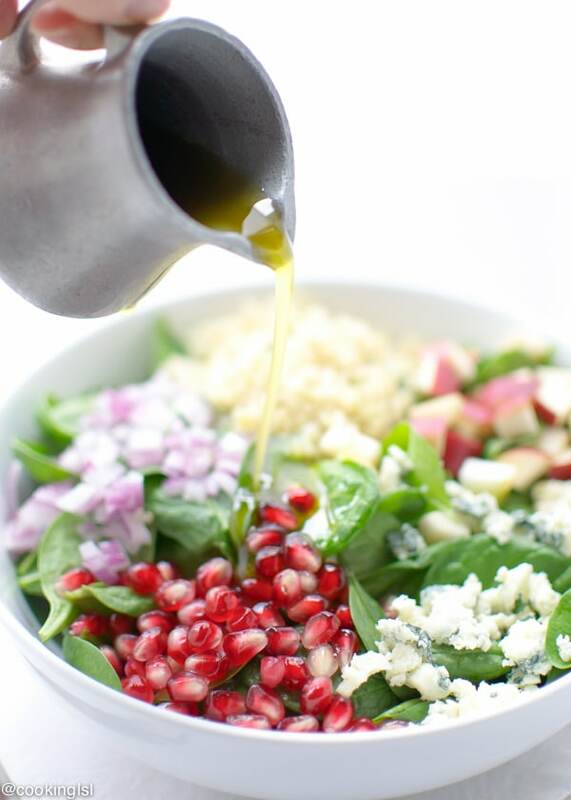 Just beautiful… And this salad – divine! Thanks for sharing! Yeah Laura, the pecans were a great addition! I like to eat salads the day before and after Thanksgiving, just to make sure I’m not over eating! Thanks Heather! Pomegranates are great for winter! I forget to eat salads in this chilly weather, but I love how seasonal this one is, think this might be tomorrow’s lunch. I hope you like it Janette! Love this! I’ve been so obsessed with quinoa lately and this is right up my alley. Thanks Katya! I love quinoa, too! Ahhh such a pretty salad and so are the pictures Mira. I bet it’s delicious too. Thanks Kathy! Yeah, it was light and delicious! 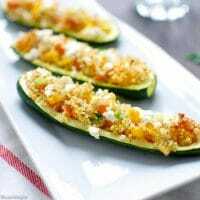 What a great idea to add quinoa to a salad to make it more filling! I have everything for this right now and will definitely be trying it, I love all the colours, so pretty! So colorful and healthy! This would make a fabulous Thanksgiving salad. 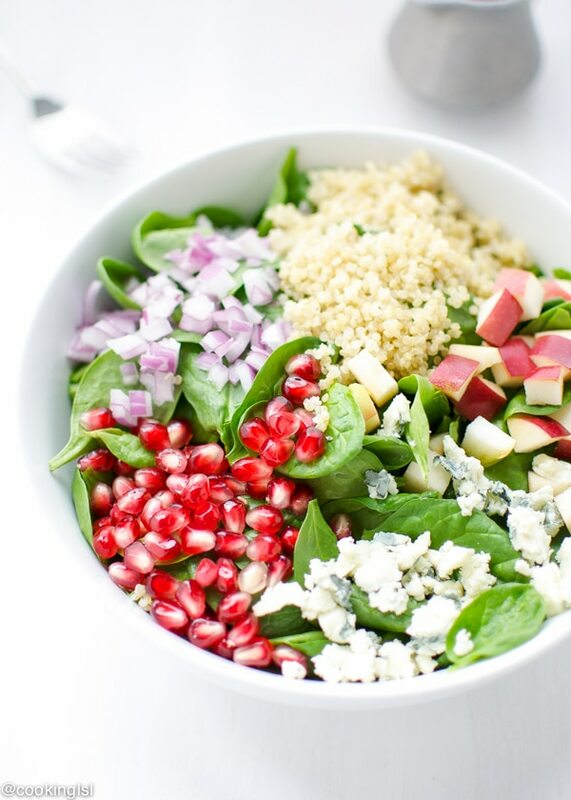 This really looks like the perfect salad! 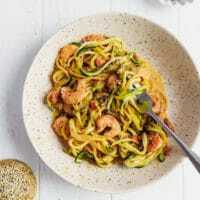 So beautiful, nutritious and delicious! 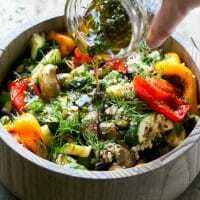 Such a colorful, healthy, and delicious salad recipe, Mira! I could eat this salad every day!